If you spend a lot of time hosing down your garden chances are you might find it easier to use something more lightweight. In this post we review some of the best lightweight garden hoses available to date. Later in the article we take a look at what makes a great lightweight hose to help you find the best fit for your needs. Why should I consider getting a lightweight hose? If you find yourself frequently hosing around your garden, investing in a lightweight hose will help make this process as easy and as comfortable as possible. This really depends on your budget and the size of your garden. We recommend reading the buyers guide section of the document to understand what you’re looking for. However, if you don’t have time to read the full post, we found the Water Right 400 Series to be the best lightweight garden hose to date. If you want to know why then you can find out here. Finding a great quality lightweight garden hose can be difficult. It’s not as simple as buying the first one that you find in your local home and garden store. You need to consider a variety of factors which we touch on later in the buyers guide. In this section of the post we review some of the top lightweight hose models on the market to date. Below we’ve listed 6 of the best lightweight garden hoses which we know you’re going to love. The Water Right 400 Series is a solid lightweight drinking water safe hose that is packed with desirable features. The hose is designed to resist permanent kinking and is soft, flexible, and lightweight. The polyurethane material used to manufacture this hose contributes to its’ ability to provide odorless and tasteless drinking water for year-round refreshment. The hose contains no harsh chemicals that could interfere with the quality of drinking water. The Water Right hose can accommodate all weather conditions and running water up to 140 degrees Fahrenheit. Coming in at a length of 25 feet (which is just right for small outdoor projects around the home), this cobalt blue garden hose promises to deliver. The HoseCoil Blue is designed for use at home for your lawn and landscaping projects or for use on the go with your RV. While this hose can be used for on the go washdowns, it has not been tested for drinking water use. The HoseCoil is an easy to use self-coiling hose that is also designed for easy storage. This water hose has an impressive usable length of 85-90% and is fully retractable. The hose material is designed to relieve strain and reinforced to prevent kinking. The hose comes equipped with either brass or stainless steel fittings to reduce water loss while in use. The gorgeous blue has a flow rate that can deliver up to 360 gallons per hour. One of the key features of the Flexilla hose is embedded in the name. This hose is designed for flexibility and its ability to handle all weather conditions. Flexilla promises to maintain its flexibility in even the most challenging weather conditions. The hose is still fully operable in temperatures between -40 and 150 degrees. This hose is also designed to be extremely durable featuring abrasion resistant coverings and crush resistant aircraft aluminum fittings. This hybrid polymer hose promises to remain kink free and always remain flat for an uninterrupted flow during your extended watering sessions. The Flexilla garden hose is drinking water safe and lead-free. It also comes equipped with specially designed O-rings installed at the spigot specially designed to provide leak-free watering. The Zero-G hose is 50% lighter than similarly constructed vinyl hoses. This hose is perfect for a variety of tough projects at home or for commercial use. This hose is not retractable as it is designed to provide an optimum flow rate. The hose can maintain its flexibility and be used in temperatures up to 35 degrees. This hose promised to be job site tough with its abrasion, leak, and puncture resistant burst rating of 600+ PSI. The 50 foot Tuff Guard is designed for outdoor washdown use and resists kinks and knots for seamless watering. This hose is said to be able to be tied completely in a knot, and still not kink! The Tuff-Guard lives up to its tough by name providing a three-ply construction with a polypropylene double helix design. This hose touts itself as being “The Perfect Garden Hose” and is packed with some powerful features that give its competition a run for the money. The Tuff-Guard is leak resistant with machined brass male and female Garden Hose Thread built in for male and female connections at the spigot and included nozzle attachments. This hose delivers 100 pounds per square inch of maximum working pressure and an astounding 300 psi burst pressure. The Tuff-Guard brings together the best of flexibility and durability for tackling those tough outdoor watering projects. The Gilmour Flexogen Premium hose is designed for strength and flexibility for your outdoor watering projects. This heavy-duty hose boasts an impressive 500 PSI burst strength that promises an extended hose life due to its increased damage resistance. This gorgeous hose, made in the USA touts itself as being the strongest lightweight garden hose in its class. The Gilmour Flexogens’ durable construction features a patented 8-layer technology with a reinforced core. Adding to its’ overall durability and reliability are crush resistant brass connections and an included lifetime warranty. The hose cover is polished to resist collecting dirt which can result in hose abrasions helping to extend the life of this feature-packed hose. The Gilmour Flexogen Premium is mold and mildew resistant to assure a clean and well functioning hose. You aren’t going to be buying all of the water hoses in this article, and as much as we thought they were all great we had to choose our winner. After lots of consideration and comparison of the products we reviewed, we found the Zero-G 4001-50 to be the best garden hose reel available! It’s impressively light-weight with the water hose weighing just 4 lbs (the lightest of all 50ft models we reviewed). It’s very cost effective compared to some of the other 50ft models we reviewed. We love that it’s leak resistant, lead free as well as being kink resistant. It’s got a variety of lengths available ranging from 25ft to 100ft. Despite us choosing our firm favorite it’s important to remember we consider all the hoses we reviewed to be top lightweight garden hoses. Now that we’ve given you a look at some of the best lightweight garden hoses available for your outdoor needs this year, you should have a better idea of what kind of hose that you would like to invest in for your next outdoor watering project. The following buyers’ guide will give you some additional factors to consider when making your purchase. Before you decide on what type of lightweight garden hose to buy, consider your project needs. Ask yourself questions like: Is your outdoor work area a large or small space? What time of year are you planning to complete your project? Answering these questions for yourself will go a long way towards preparing you to make the best buying decision. For example, smaller project spaces won’t need longer hoses or commercial grade construction on your new hose. Weather and other factors can have an impact on the best lightweight hose for you to choose depending on the time of year that you plan to complete your project. Save yourself time and money by making the right choice for your outdoor watering project the first time. Along with project size and time of year to help determine if you need an all-weather or commercial grade hose, other factors to consider when purchasing your new lightweight hose are features, affordability, and drinkability. While some people prefer to use their outdoor garden hose for traditional washdown projects only, others like to be able to multi-task and to use their hose for drinking water while outside. Drinkability is an important factor to consider when purchasing your new lightweight garden hose as all hoses are not designed to be used with drinking water. What makes some hoses drinking water safe vs. others is the interior construction of the hose tube. The chemical construction of the hose is what determines drinkability. Some chemicals aren’t designed for humans to use or consume and these hoses will be labeled to let you know that they aren’t designed for you to drink from. Consider drinkability options when purchasing your new hose to make sure that you keep yourself and your family safe during your outdoor watering projects or family outings. Make sure that you know what you can afford to spend on a hose before you go out looking for a new hose so that you can be better prepared. Research the desired hose size, width, and features such as drinkability that we previously discussed and have a general idea of what the kind of hose that you’re looking for is going to cost before you arrive. It is good to know how much hose that you can actually afford in order to avoid being swayed by fancier hoses with features outside of your budget range. When considering the features of your next hose it is important to know which features are must-haves for you vs. those features that are only optional. For example, if your project happens to be taking place in an area that has harsh terrain or the potential for damage to your hose, then you’ll definitely want to consider heavier more durable hoses such as those designed or commercially constructed in order to prevent in mishaps or interruptions during the course of your watering project. How do I know if my hose is drinking water safe? Check for drinkability directly on the packaging of your newhose to determine if it supports drinkability. If the packaging does not clearly indicate that the hose is designed for drinkability, on the side of safety, assume that it’s not and contact the manufacturer in order to be 100% sure. What does the burst rating and PSI mean for my hose? The burst rating and PSI let you know the amount of pressure per square inch that your hose has been tested to withstand before bursting or malfunctioning. The higher this rating and number, the higher amount of water pressure and/or weight your hose can withstand. What are some important features that all lightweight garden hoses should have? Any lightweight garden hose should provide durability in order to resist abrasions, tears, and holes. The hose should also provide maximum flexibility in order to maneuver easily around obstacles, and be resistant to kinks in order to assure an uninterrupted flow. Portability and Drinkability are also nice features for a hose to have. Now you are fully equipped with the knowledge and understanding that you need to purchase the best lightweight garden hose for your outdoor project needs. 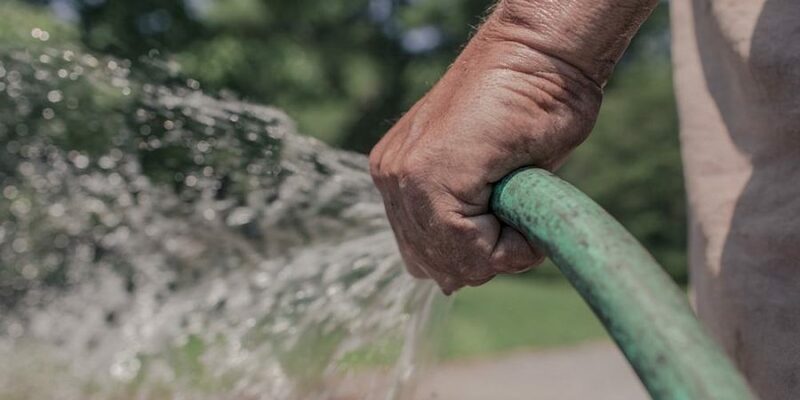 Be sure to consider all of the factors that we’ve discussed here when you’re ready to make your next garden hose purchase in order to make your best buying decision and avoid return trips to the store to exchange or replace an incorrect hose. Leave a little bit of wiggle room in your budget when you’re ready to buy as today’s lightweight hoses have lots to offer. You may find that the perfect hose for you has a variation in color, material, or other additional desirable features that you didn’t plan for during your research stage. Depending on your budget you may find the hose of your dreams or simply one to get the job done. It’s really all a matter of preference once you get beyond the basics of what your dream hose should have. If you’re looking for hose reels we’ve written a post similar to this one dedicated to them that you can check out here. In the meantime, we’re glad to be able to provide you with some tips and useful information in order to help you make a more informed buying decision. For more information on garden hoses why not head over to the wiki page.